Yorkshire rivals Barnsley and Sheffield Wednesday had to settle for a point at Oakwell as both sides' disappointing Championship form continued. Barnsley, under caretaker manager Paul Harsley for the first time, had the better of the chances but have still only won once since early November. Atdhe Nuhiu's penalty after Andy Yiadom fouled Lucas Joao put the Owls ahead. Oli McBurnie slotted in for the Tykes midway through the first half to level, but neither side could find a winner. This south Yorkshire derby came just five days after Paul Heckingbottom left the Tykes to take charge of Championship rivals Leeds. The club said they were "shocked" and "thoroughly disappointed" by Heckingbottom's decision, after the 40-year-old left with Barnsley just one point above the relegation zone. 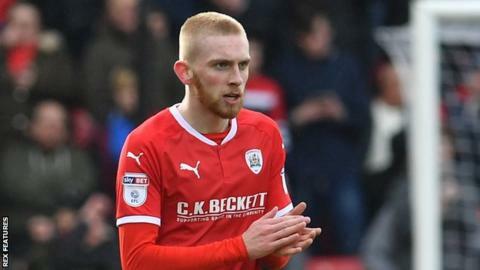 Barnsley, who have struggled for goals this season, looked more potent in attack with on-loan forward McBurnie leading the line. The 21-year-old Swansea striker, starting for the first time, finished coolly into the bottom corner from Gary Gardner's pass just a couple of minutes after Nuhiu's spot kick. Tom Bradshaw also went close for the hosts before the break, but his shot was well saved by Joe Wildsmith. A dour second half left Sheffield Wednesday manager Jos Luhukay without a league victory since taking over on 5 January and Barnsley with just one win in their last 16 Championship games. "You never know what's going to happen but the second I walked into the changing room on Tuesday morning I knew everyone was on side. "After the game I told the lads I couldn't thank them enough. They could have had their heads turned but they responded brilliant. "I was asked to do this game and I've done it to the best I could in the short space of time. "I'm just gutted we didn't get the three points." "I think after 90 minutes we must live with this draw. Both teams had chances. "We scored the first goal but we couldn't stay in front. "We had four or five situations but we only scored from the penalty spot. Today who scores the second goal would have left as the winner. "We have our problems today but we must make the most of it to have the stability and also to play good football." Match ends, Barnsley 1, Sheffield Wednesday 1. Second Half ends, Barnsley 1, Sheffield Wednesday 1. Ross Wallace (Sheffield Wednesday) is shown the yellow card for a bad foul. Nick Townsend (Barnsley) wins a free kick in the defensive half. Dangerous play by Ross Wallace (Sheffield Wednesday). Offside, Sheffield Wednesday. Liam Palmer tries a through ball, but Atdhe Nuhiu is caught offside. Attempt saved. Tom Bradshaw (Barnsley) header from the centre of the box is saved in the centre of the goal. Assisted by Andy Yiadom with a cross. Joe Williams (Barnsley) wins a free kick in the defensive half. Attempt missed. Adam Reach (Sheffield Wednesday) left footed shot from outside the box is high and wide to the right. Assisted by Jack Stobbs with a headed pass following a corner. Corner, Sheffield Wednesday. Conceded by Daniel Pinillos. Attempt missed. Kieffer Moore (Barnsley) header from the centre of the box is close, but misses to the right. Assisted by Adam Hammill. Attempt missed. Joey Pelupessy (Sheffield Wednesday) right footed shot from a difficult angle and long range on the left is close, but misses to the right following a corner. Attempt blocked. Frederico Venâncio (Sheffield Wednesday) right footed shot from the centre of the box is blocked. Assisted by Joey Pelupessy with a cross. Corner, Sheffield Wednesday. Conceded by Liam Lindsay. Corner, Sheffield Wednesday. Conceded by Joe Williams. Attempt blocked. Ross Wallace (Sheffield Wednesday) left footed shot from outside the box is blocked. Assisted by Adam Reach. Attempt blocked. Adam Reach (Sheffield Wednesday) left footed shot from the centre of the box is blocked. Substitution, Sheffield Wednesday. Frederik Nielsen replaces David Jones because of an injury. Attempt saved. Daniel Pinillos (Barnsley) left footed shot from outside the box is saved in the bottom left corner. Assisted by Joe Williams. David Jones (Sheffield Wednesday) is shown the yellow card for a bad foul. Delay in match David Jones (Sheffield Wednesday) because of an injury. Foul by David Jones (Sheffield Wednesday). Foul by Connor Mahoney (Barnsley). Substitution, Barnsley. Kieffer Moore replaces Oliver McBurnie. Foul by Tom Bradshaw (Barnsley). Frederico Venâncio (Sheffield Wednesday) wins a free kick in the defensive half. Attempt missed. Joey Pelupessy (Sheffield Wednesday) right footed shot from outside the box misses to the left. Assisted by Adam Reach. Offside, Sheffield Wednesday. Liam Palmer tries a through ball, but Lucas João is caught offside. Attempt missed. Tom Bradshaw (Barnsley) header from the centre of the box is high and wide to the left. Assisted by Adam Hammill with a cross. Substitution, Sheffield Wednesday. Jack Stobbs replaces Jordan Thorniley. Attempt missed. Andy Yiadom (Barnsley) right footed shot from outside the box is too high. Attempt missed. Frederico Venâncio (Sheffield Wednesday) header from the centre of the box misses to the left. Assisted by Ross Wallace with a cross following a corner. Substitution, Barnsley. Connor Mahoney replaces Lloyd Isgrove. Attempt missed. Ross Wallace (Sheffield Wednesday) left footed shot from the right side of the box is close, but misses to the left. Assisted by Liam Palmer. Attempt blocked. Adam Reach (Sheffield Wednesday) left footed shot from the centre of the box is blocked. Assisted by Morgan Fox.